Tear bread roll into small pieces and soak in milk for approx. 5 – 7 min. until soft. In the meantime, finely chop onion and sauté in a small frying pan with some vegetable oil until translucent. Add sautéed onion, ground beef, egg, allspice, salt, and pepper to the bowl with the soaked bun and mix well until just combined. Form beef mixture into balls (approx. 3 cm), place on a plate, cover, and cool for approx. 20 – 30 min. Melt butter in a large frying pan and brown meatballs from all sides for approx. 15 – 20 min. over medium heat. Make sure that the pan is not overcrowded. Remove cooked meatballs from the pan and set aside. For the sauce, sauté flour in the remaining cooking oil and fill up with beef stock while stirring constantly. Then, stir in heavy cream. Bring sauce to a simmer for approx. 5 – 7 min. until thickened. To finish, season with soy sauce and pepper. 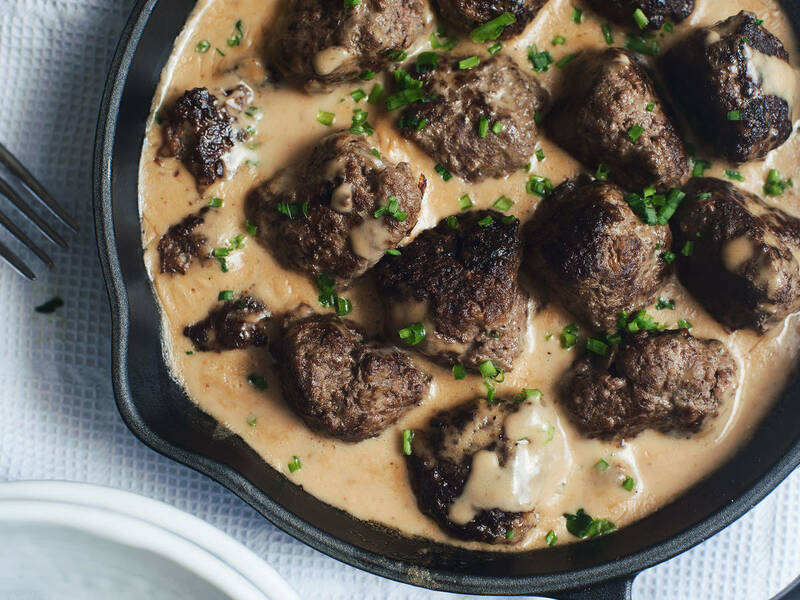 Return meatballs to the pan, toss in sauce, and serve with lingonberry jam and mashed potatoes.